Here you will find close out, overstock, clearance, returns, and open package items for sale. All close out items are sold "As Is" and No refunds. Exchanges or store credit will not be issued for these items. Any item in the close out section that is a return, open package or anything that isn't a new unopened container will be marked as such. Close Out Items do not qualify for any online or instore promotions, discounts or coupons. 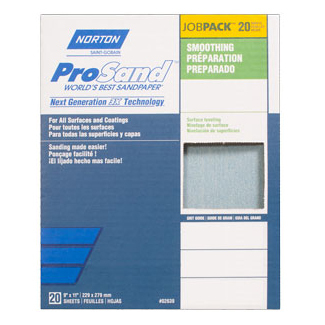 Our tough, durable and long-lasting sanding sheets with next-generation 3X technology offer superior sanding performance for a premium surface finish. Excellent on all surfaces and coatings and won't clog, tear or transfer color. Premium heat-treated abrasive offers faster cut and longer sanding life than 3X technology. Heat treating toughens the grain allowing it to stay sharp and last longer under extreme pressure, making it the most durable abrasive on the market. Super sharp edges allow grain to remove material faster. 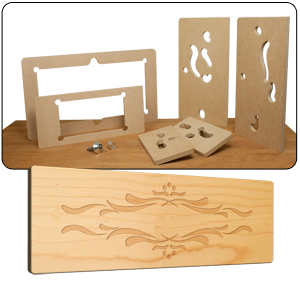 With this unique template set, you will be able to make beautiful ”chip style” carvings on your cabinet doors and drawers. Each template is capable of making multiple patterns depending on how detailed you want your final look to be. The set comes with a unique cone shaped router bit that gives you that “chipped carved” look. The cone tip only allows the cutter to plunge as far as the template will allow, this produces wonderful patterns with depth and appeal. 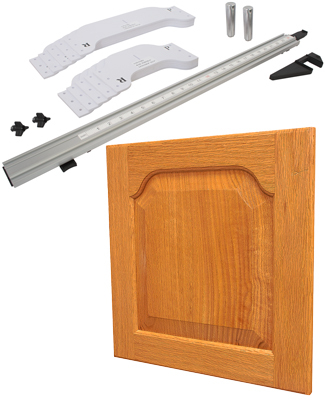 The Door & Drawer Router Carving Template Set is designed to be used with a plunge style router. 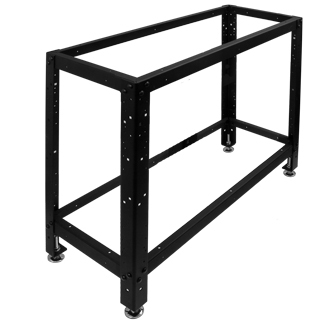 This 12" x 48" x 28" Tall Universal Stand can be used to make a cabinet, workbench, assembly table and more. The legs are pre-drilled hinged cabinet doors and side panel a breeze. 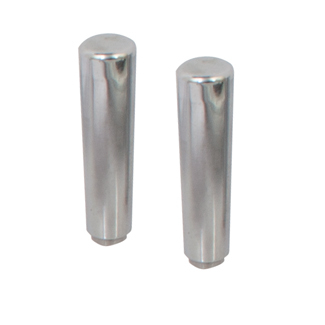 Each leg and stretcher also has square holes for carriage bolts (included) whick makes assemdling the work station easy. The legs are 1/8" thick steel supported by 4" x 1/2" adjustable heavy duty leg levelers. The strectchers can be placed at multiple locations on the legs to make room for adding drawers and compartments. Use most any material for your benchtop. The Universal Work Station includes everything you need to construct a 12" x 48" x 28" frame including the 4 leg levelers and all hardware. For all your large projects, up to 30% wider spray. BIG projects made quick and easy. 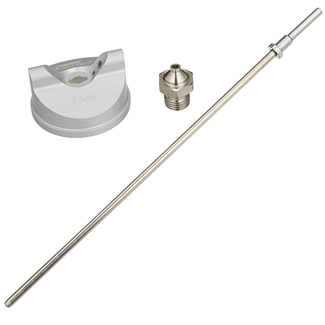 2.5 mm needle, fluid tip and nozzle for the Pro 8 pressure or gravity fed spray guns. Used with the SprayPort 6002 and 6003 HVLP sprayers. The Extendable Large Dovetail system takes a simple approach to making beautiful thru-dovetail's, a hallmark of fine craftsmanship. The hardest part about cutting dovetails is marking and cutting the matching angles to one another. That's what makes this system so easy. We have done the math for you and milled the exact cuts that need to be made in this heavy duty and easy to use jig. Because the bearing is already centered on the bit it makes setting up the cut for the joint fast and easy. For stock 3/4" to 1" thick. Some woodworkers have avoided making arched raised panel doors for two reasons: the difficulty of marking arched cuts and the expense of hold down jigs. This system solves both problems by eliminating the need for high-cost hold down jigs and by providing step by step instructions with the templates. 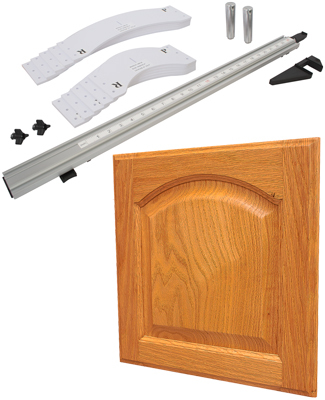 The twenty-piece template package includes ten sizes for the panels and the ten corresponding templates for the matching arched rails. Each template is individually la bled with its size which indicates overall door width; any door between 10 " and 19 " can be made. All templates are made of Granular PVC. 1 of ea. from 10" to 19"
Create that custom look for your cabinet doors with the Panel Master PRO™ System. Two heavy duty steel handles attach directly to the new 24" PRO-GRIP™ 180° straight edge clamp. 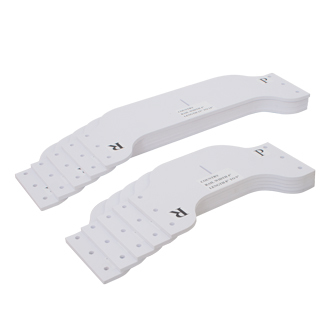 This unique system provides you with a rock solid platform to hold your templates to the top of the clamp while your stock is secure in the bottom of the clamp. Use the system for panels and rails or even use it for small parts that need to be routed, keeping your hands away from the cutters. The 180° straight edge clamp has an adjustable handle which rotates so that it doesn't interfere with the table top while running your stock through the router. 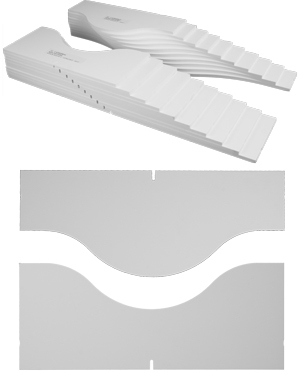 10 piece Cathedral template set, which will do panels and rail profiles from 10" to 19" wide. 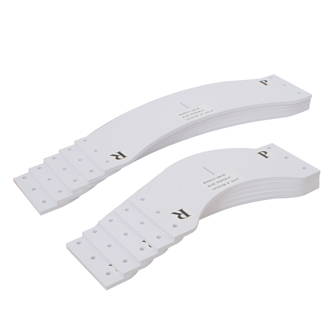 10 piece Roman Arch template set, which will do panels and rail profiles from 10" to 19" wide. 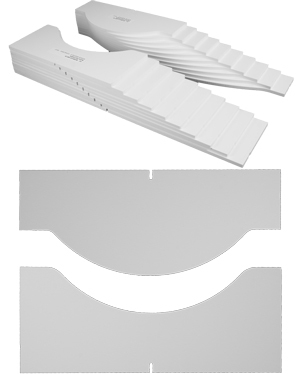 10 piece Country template set, which will do panels and rail profiles from 10" to 19" wide. Designed for the Panel Master Pro System, but can be used without. 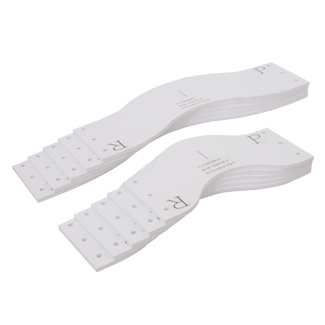 Can be used with your own DIY Jig, double face tape or be tacked to create the profile for you cabinet doors. Will do from 10" to 19" wide. These Heavy Duty Steel Handles are made for the Panel Master Pro System, but can be used for any DIY Jig. 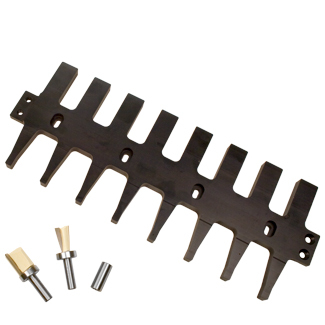 Includes the T-Bolts to be used in any Pro-Grip Clamp or DIY Jig.